About: Google Wallet is a peer-to-peer payment application that allows users to send and receive money from anyone with an email address or phone number even if they don’t have the app. Money sent can be directly transferred into your bank account, and the system also includes features that allows the user to track the money sent and received. 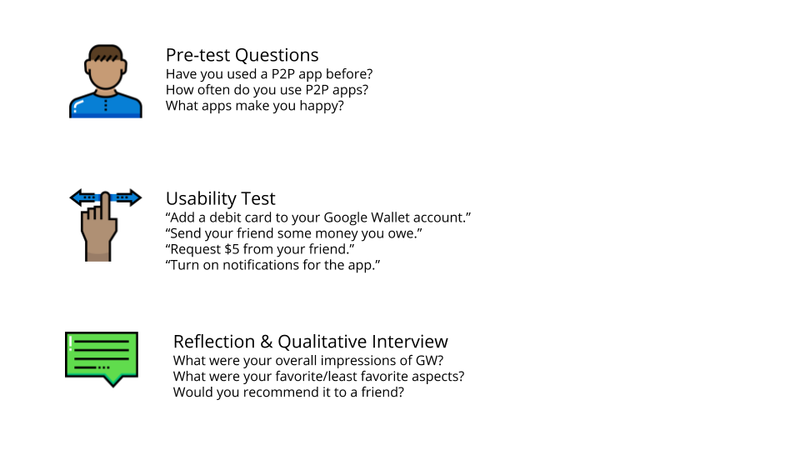 Scope: Assess the needs of Google Wallet users and conduct usability testing to understand the needs and pain points of university-aged users. 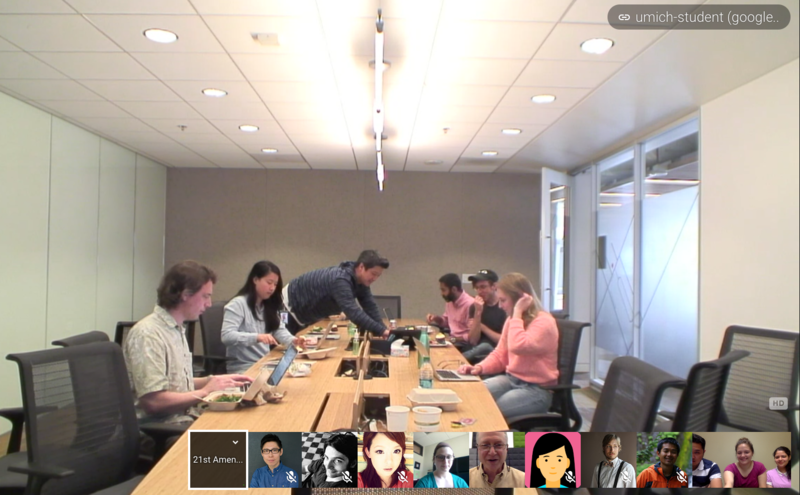 Our main research question was "how can Google Wallet make the experience more emotionally pleasing for its users?". 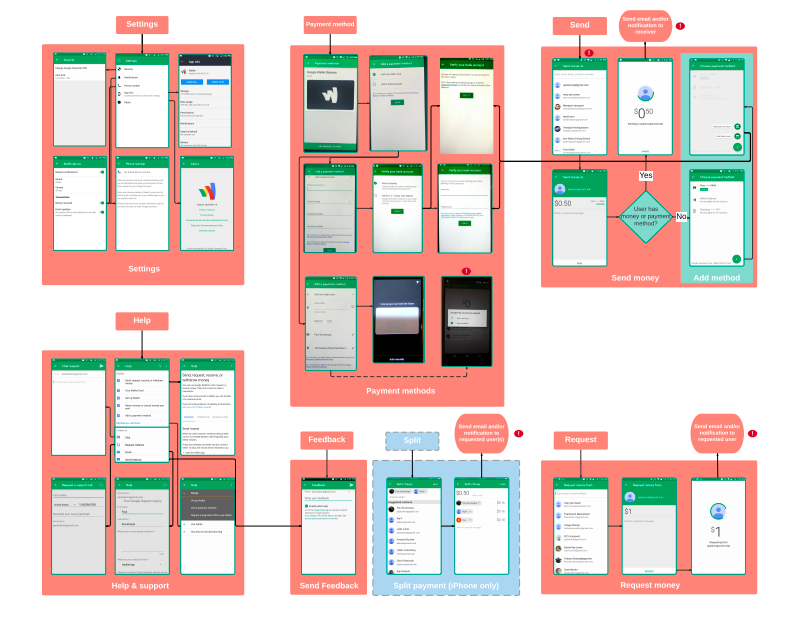 An interaction map of the Google Wallet system was performed to familiarize ourselves with how the product works and what it consists of, and also to have a point of reference when we continued on with our research. We wrote and conducted 5 interviews with Google Wallet and Venmo users between ages 18-24 years (University-aged) to understand what this target demographic finds pleasing and displeasing about Google Wallet and to understand the context and motivations of using a peer-to-peer payment system. "I only use [Google Wallet] because my friends are using it." " Google Wallet feels very transactional. It’s like I’m doing a financial transaction, and I don’t know who with, and I think Venmo feels a little bit more social." "I always feel a little bit uncomfortable requesting money." 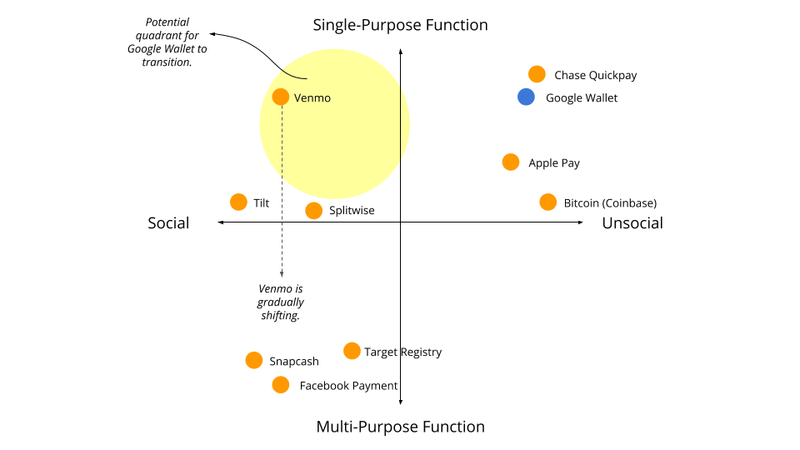 We conducted comparative market research to understand the market space of peer-to-peer (P2P) payment applications and help us understand how Google Wallet can differentiate itself from its competitors. 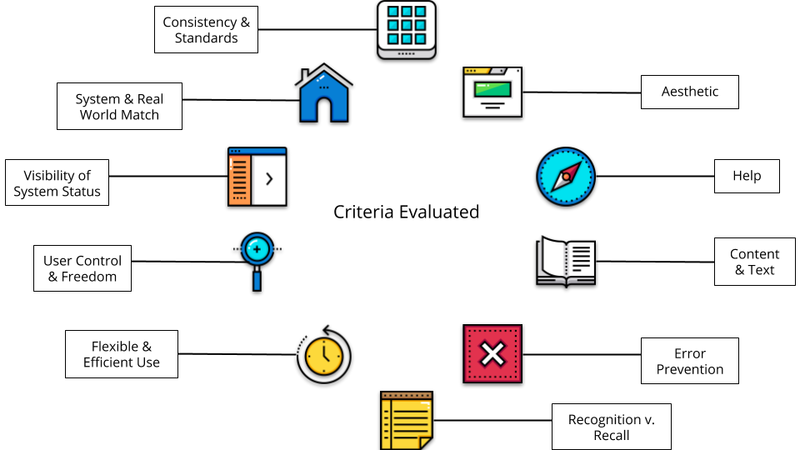 We created and sent out surveys to understand existing user issues, and to understand their behaviors and attitudes regarding P2P applications and processes, as well as payments and Google in general. Usability testing was conducted to observe the user's painpoints to and understand their behavioral patterns when approaching the system's key function. Network effect dictates what P2P applications are popular: Users typically used a system that their friends or family were using. 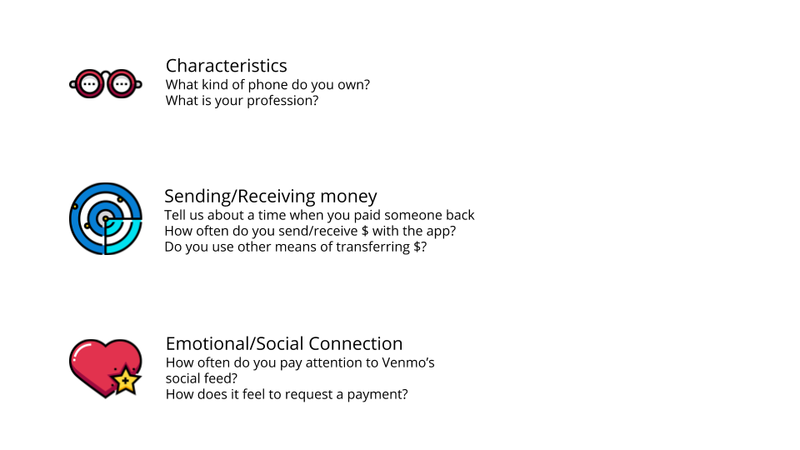 For the most part, University-aged users that were interviewed utilized Venmo. We found that this typically leaned towards the receiver, that is, whichever system the receiver was using dictated what P2P application was utilized. 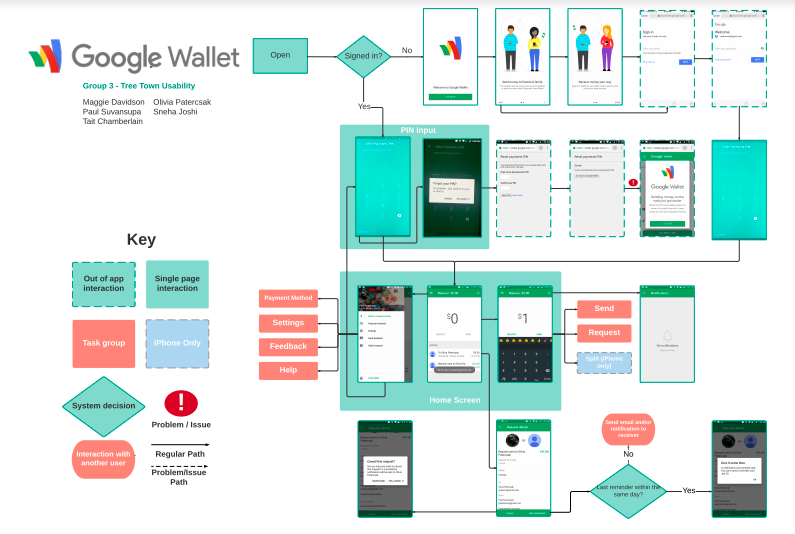 Google Wallet is perceived as "cold, transactional": While users tend to not care for the social features within other P2P applications and found the interface of Google Wallet clean and pleasant, they felt as though Google Wallet felt like a more formal, transactional process. 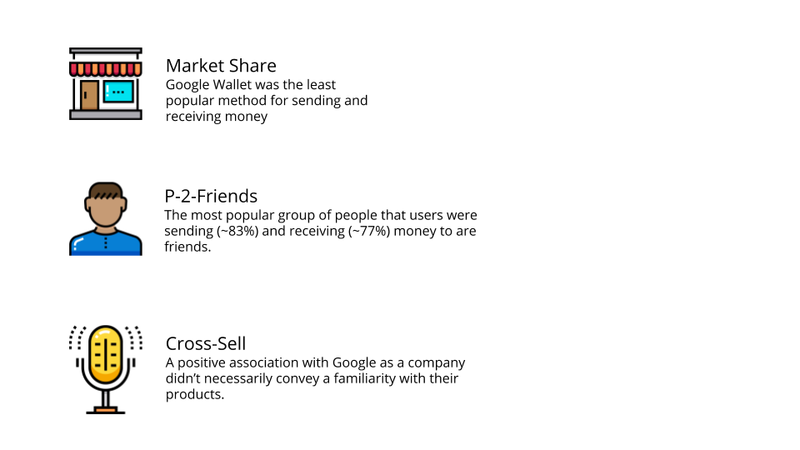 Most users wanted a system that not only made sending and receiving money easy, but also less formal. Minor usability issues throughout the system: We uncovered very minor usability issues within the product, such as confusing information architecture in terms of enabling/disabling notifications, and lack of system status updates when the application crashes or when users send or request money. Positive association with Google doesn't necessarily convey a familiarity with Google products: While most of those surveyed noted that they felt positively towards Google as a company, not all of them were familiar with Google's novel products, like Google Apollo, Google Fit, or Google Wallet. Additionally, this proved to cause confusion as to what the app's functions were especially in relation to Android Pay. This will let users know that their request or submission has been received by the end user, to diminish uncertainty, and to increase trust within the system. This will streamline the send/request money process for users and diminish confusion as to how to initiate a transaction. A dedicated button will allow users the option to send emojis in a consistent way across operating systems and create a warmer, social atmosphere. To increase usage and awareness, it is important to emphasize the different use scenarios between Google Wallet and Android Pay, as well as to familiarize users with Google Wallet's key features and capabilities. The icorporation of these animations can create a fun, social experience versus the "cold, transactional" feel that Google Wallet emits, while keeping in line with the Google brand. Many user issues are lying just below the surface, and it takes a bit of digging to uncover them! User security is an important issue to consider, both in the design of an application as well as in user research. Awareness of a brand doesn't necessarily convey an awareness of their products and use cases, and it is detrimental to the product's success to assume so. Thank you to Google Wallet and my SI 622 team for making this an awesome learning experience!